Question: What do Rheumatoid Arthritis, Lupus, Multiple sclerosis, Ulcerative Colitis, and Addison’s disease all have in common? If your answer was that they are all serious health conditions that you never want to have, you would be on the right track. However, a better answer in this instance is that they are all autoimmune diseases—illnesses in which your immune system attacks your own tissues and cells. There are a number of things that you might not know about autoimmune-caused illnesses and a few things about how Chinese medicine can help. First, it’s important to understand that autoimmune diseases are caused by a case of mistaken identity. The job of your immune system is to identify outside invaders—things like viruses, bacteria, pollen, and parasites—and attack them in an effort to keep you healthy. In autoimmune diseases, your immune system attacks healthy cells by mistake. It is not clear what causes your immune system to attack your body, but there are a number of possible triggers. Some autoimmune conditions seem to be genetic in nature, but toxins, viral infections, hormonal imbalances, and chronic inflammation are possible offenders. Autoimmune attacks affect your body in one of two ways: The attack can cause reduced function of the affected cells, or it can cause hyperactivity. For example, autoimmune disease of the thyroid gland that regulates your metabolism can cause either a hypoactive gland causing a sluggish metabolism, or hyperactivity of the gland causing your metabolism to go into overdrive. 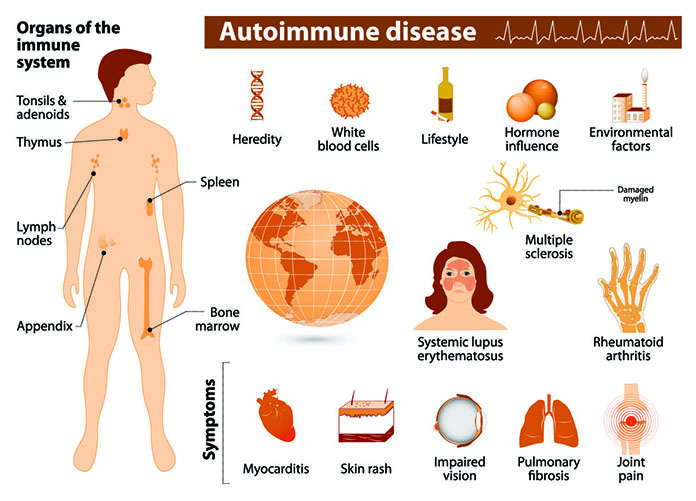 Autoimmune conditions can cause a wide variety of diseases, affecting almost any part of your body, including your skin, joints, digestive tract, glands, heart, lungs, brain, and nervous system. 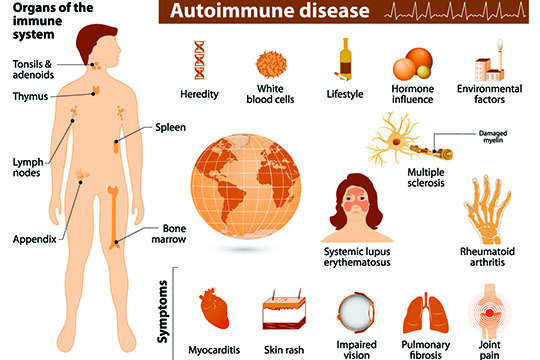 An autoimmune condition can attack a specific organ or body part, such as the thyroid gland mentioned above, or it can attack systematically, such as in the case of Lupus or Rheumatoid Arthritis. How Can Autoimmune Diseases Be Treated? In Western medicine, treatment for autoimmune illnesses consists of correcting deficiencies with hormones, or taking immune suppressing drugs or steroids that control or suppress your immune system. While these medications can help relieve symptoms, they may also come with a variety of side-effects and can leave you with a compromised immune system. In Chinese medicine, autoimmune illnesses are viewed a little bit differently than in Western medicine. One of the basic concepts of Qi in Chinese medicine is that it has a number of jobs to keep your body healthy and running. For example, it keeps you warm and moving, transforms food into energy and nutrients, and keeps your blood coursing through your vessels. Another primary task of your Qi is to protect you from outside invaders. You have a kind of defensive Qi, called Wei Qi, which acts like a protective barrier to keep pathogens from getting in and making you sick. So if you are having autoimmune issues, the underlying cause is a depletion of this defensive Qi. While the source of your autoimmune illness is being depleted, that depletion opens the door for a number of pathogens that cause symptoms and affect your health. In Chinese medicine, pathogens act a little bit like bad weather, disturbing the balance in your body. You can have heat, which might manifest as night sweats, inflammation, a red rash, or restlessness and irritability. With a cold pathogen, you are likely to feel cold, sluggish, and your symptoms tend to be worse in the cold weather. Dampness is also a common pathogen, especially for people suffering from autoimmune symptoms. Signs of dampness may include a sensation of heaviness, swelling, digestive issues, and a general feeling of bogginess. Treatment for an autoimmune illness in Chinese medicine begins with determining the nature of your symptoms as well as diagnosing your specific imbalance. Your practitioner would need to determine the nature of your depletion, as well as what pathogens have triggered your immune system to attack normal cells. After determining an accurate diagnosis, your practitioner would develop a treatment plan that likely would include acupuncture, herbs, diet modifications, rest, and other lifestyle tweaks to help you recover as quickly as possible. How Can I Help Lower The Risk? -Stress can be an important factor in autoimmune conditions. Stress affects every system in your body, putting those systems that aren’t needed in the fight or flight moment on the back burner—most notably immunity and digestion. -Avoid exposure to environmental molds. Toxins from household molds have been linked to some autoimmune conditions. -Also avoid exposure to irritating chemicals, such as those found in building materials, new carpeting, and toxic cleaning products. -Be sure to get enough rest or sleep, especially if you seem to catch every cold or flu that’s going around. -If you suspect food sensitivities might be triggering symptoms, try eliminating questionable foods that might be causing you problems. Generally if a food is the culprit, you will feel dramatically better when you get it out of your diet. Common offenders include wheat, dairy products, eggs, corn, citrus fruits, meat, nuts, and tomatoes. -Recognize that inflammation is a big player in autoimmune diseases. There are a number of dietary changes that researchers have found to reduce inflammation. In general, shifting the focus of your diet from processed foods and an animal-based diet to one that is more plant based and home cooked is a good way to start. If you’re struggling with the symptoms of an autoimmune illness, consulting with a practitioner of Chinese medicine offers you a well-rounded and holistic treatment strategy. While many autoimmune diseases have no cure, it’s possible through good self-care, lifestyle changes, and help from Chinese medicine, to alleviate symptoms and prevent your illness from progressing. If you’re struggling with the symptoms of an autoimmune illness, consulting with a practitioner of Chinese medicine offers you a well-rounded and holistic treatment strategy. Previous post: Having Trouble Breathing Because Of Asthma? Here Are 6 Natural Remedies That Will Help!